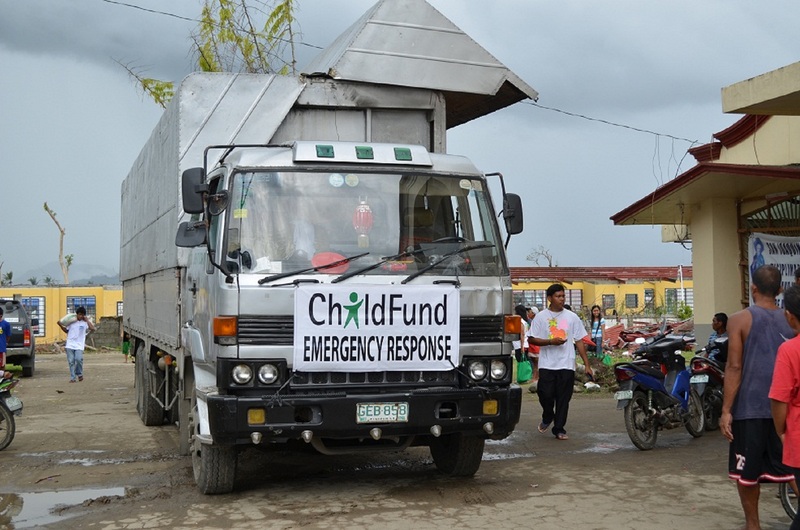 ChildFund vehicles delivering aid to the affected areas in the Visayas. Over the last number of weeks since Super Typhoon Haiyan left a path of destruction across the Philippines, ChildFund has been continuing to address the immediate needs of affected children and families. Through the implementation of ChildFund’s emergency response and initiated activities ChildFund has been supporting children, families and communities across the Ormoc, Iloilo, Roxas City, Bantayan Island, Tacloban, Palo, Tanauan and Tolosa areas. The latest figures released by the National Disaster Risk Reduction Management Council (NDRRMC) show that over 16 million people have been affected – more than 3.4 million families – and over 4 million people are displaced. Of those, 98% are outside Evacuation Centres. Tacloban Airport operations remain limited. Sixteen barges shuttle vehicles have been sent from Matnog, Sorsogon to Allen, Northern Samar, to assist supply chains from Luzon to Leyte. Much of the power grid in affected areas has been restored, though these communities continue to endure rotating brownouts. The government has declared the water supply for Leyte sufficient. Mobile communications providers have also restored much coverage in affected areas in the Visayas, though signal strength is analogous to each network’s pre-typhoon levels. ChildFund’s overall objective is to provide for families and children affected by the super typhoon an integrated response, addressing their well-being, development and protection needs during the relief and early recovery stage. Therefore, our response is divided into these two phases – relief and recovery -, with specific interventions for each phase. 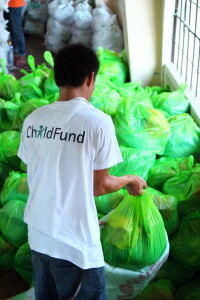 ChildFund’s Food Item packs are assembled at this parish in Cebu City. These goods will go to communities in Leyte that were affected by typhoon Haiyan. ChildFund added an additional CCS site in one location in Barangay Culasi, but operating only at a reduced schedule due to the holidays. Now that school in the area has resumed, the three CCS sites (2 in Culasi, 1 in Banika) operate on weekends only. For this reporting period (December 23rd – January 4th) no child protection issues were observed. The only health issues observed were coughs and colds common to the cooler months in the Philippines. These can be managed with common remedies available at home. ChildFund, with funding from the Filipino Association from Papua New Guinea, also organised Christmas celebrations in their CCS on December 23rd. This celebration was attended by representatives from UNICEF, who also donated school supplies which children having been using since the classes were resumed on January 6th. They also brought a photo booth, so children and their families could enjoy getting holiday photos and taking home prints. UNICEF also provided paints and canvass for a mural, that formed part of the festive programme. The programme also included games, songs and various performances that were enjoyed by children, teachers, and parents. Gifts and snacks were provided to every child. As per consultation with children in Banica, gifts exchanged. CCS activities continued in Tolosa (2 sites), in Palo (3 sites) and Tacloban (2 sites) during this period. Most staff has been on deserved holiday break during this period with one ChildFund staff and most volunteers continuing to support critical operations in this area. Between December 23rd and January 4th, 5000 food items were distributed to 2,411 families, and 1,000 non-food items reached 997 families in Tanauan. The Table below depicts accumulative numbers of food items/ non-food items delivered and active CCS locations. 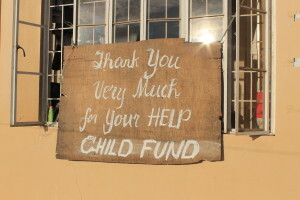 Over the last month, ChildFund Philippines has been in discussions with UNICEF Child Protection and Education to partner on child protection in emergencies and recovery activities as well as restoring access to adequate basic education and Early Childhood Care and Development (ECCD) in areas affected by the Typhoon. A proposal with a project length of 12 months was submitted mid-December that continuous to be refined since UNICEF has asked us to expand the coverage and also include education. UNICEF continues to be interested in signing one Project Cooperation Agreement and ChildFund is expecting it to be signed in early January. Two proposals submitted to ChildFund Korea have been funded by KOICA and will cover food, non-food item distribution as well as the establishment and implementation of one CCS for 2 months on Leyte Island. Young survivors volunteer to help other survivors at ChildFund’s CCS sites. If you would like to help typhoon Haiyan survivors through ChildFund, please donate now.